Apple has designed the software interfaces to Core Audio using a layered, cooperative, task-focused approach. Read the first two sections in this chapter for a brief introduction to these interfaces and how they work together. Continue reading to understand the design principles, use patterns, and programming idioms that pervade Core Audio. The later sections in this chapter introduce you to how Core Audio works with files, streams, recording and playback, and plug-ins. 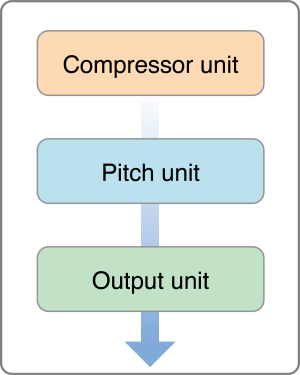 The programming interfaces for Core Audio are arranged into three layers, as illustrated in Figure 2-1. Mac apps can be written to use these technologies directly when they require the highest possible, real-time performance. Many audio applications, however, don’t access this layer. Indeed, Core Audio in iOS provides ways to achieve real-time audio using higher level interfaces. OpenAL, for example, employs direct I/O for real-time audio in games. The result is a significantly smaller, tuned API set appropriate for a mobile platform. The middle layer in Core Audio includes services for data format conversion, reading and writing to disk, parsing streams, and working with plug-ins. Audio Converter Services lets applications work with audio data format converters. Audio File Services supports reading and writing audio data to and from disk-based files. Audio Unit Services and Audio Processing Graph Services let applications work with digital signal processing (DSP) plug-ins such as equalizers and mixers. Audio File Stream Services lets you build applications that can parse streams, such as for playing files streamed over a network connection. Core Audio Clock Services supports audio and MIDI synchronization as well as time-base conversions. Audio Format Services (a small API, not shown in the figure) assists with managing audio data formats in your application. 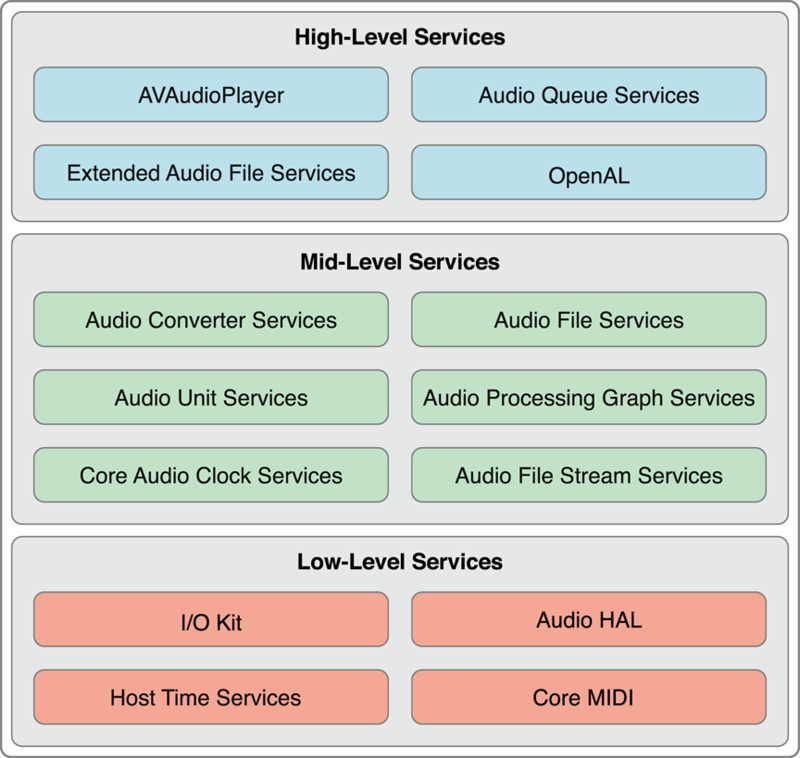 Core Audio in iOS supports most of these services, as shown in Figure 1-2. The highest layer in Core Audio includes streamlined interfaces that combine features from lower layers. Audio Queue Services lets you record, play, pause, loop, and synchronize audio. It employs codecs as necessary to deal with compressed audio formats. The AVAudioPlayer class provides a simple Objective-C interface for playing and looping audio as well as implementing rewind and fast-forward. Extended Audio File Services combines features from Audio File Services and Audio Converter services. It gives you a unified interface for reading and writing uncompressed and compressed sound files. OpenAL is the Core Audio implementation of the open-source OpenAL standard for positional audio. It is built on top of the system-supplied 3D Mixer audio unit. All applications can use OpenAL, although it is best suited for games development. You get another view of Core Audio by considering its API frameworks, located in /System/Library/Frameworks/. This section quickly lists them to give you a sense of where to find the pieces that make up the Core Audio layers. Take note that the Core Audio framework is not an umbrella to the other frameworks here, but rather a peer. The Audio Toolbox framework (AudioToolbox.framework) provides interfaces for the mid- and high-level services in Core Audio. In iOS, this framework includes Audio Session Services, the interface for managing your application’s audio behavior in the context of a device that functions as a mobile phone and iPod. The Audio Unit framework (AudioUnit.framework) lets applications work with audio plug-ins, including audio units and codecs. The AVFoundation framework (AVFoundation.framework) provides the AVAudioPlayer class, a streamlined and simple Objective-C interface for audio playback. It also provides the AVAudioEngine class for more sophisticated audio handling. The Core Audio framework (CoreAudio.framework) supplies data types used across Core Audio as well as interfaces for the low-level services. The Core Audio Kit framework (CoreAudioKit.framework) provides a small API for creating user interfaces for audio units. This framework is not available in iOS. The Core MIDI framework (CoreMIDI.framework) lets applications work with MIDI data and configure MIDI networks. This framework is not available in iOS. The Core MIDI Server framework (CoreMIDIServer.framework) lets MIDI drivers communicate with the OS X MIDI server. This framework is not available in iOS. The OpenAL framework (OpenAL.framework) provides the interfaces to work with OpenAL, an open source, positional audio technology. The Appendix Core Audio Frameworks describes all these frameworks, as well as each of their included header files. You instantiate an audio file object—and create an actual audio file tied to that object—by calling the AudioFileCreateWithURL function. The function gives you a reference to the new audio file object. From that point on, you work with the real audio file by communicating with the proxy object. This sort of pattern is consistent throughout Core Audio, whether you are working with audio files, iPhone audio sessions (described in Audio Sessions: Cooperating with Core Audio), or even hardware devices. Most Core Audio interfaces use a property mechanism for managing object state or refining object behavior. A property is a key-value pair. A property key is typically an enumerator constant with a mnemonic name, such as kAudioFilePropertyFileFormat or kAudioQueueDeviceProperty_NumberChannels. A property value is of a particular data type appropriate for the purpose of the property—a void*, a Float64, an AudioChannelLayout structure, and so on. There are many Apple-defined properties. You’ll find their definitions in the various Core Audio framework header files. Some Core Audio interfaces, such as Audio Unit Services, let you define your own properties as well. Core Audio interfaces use accessor functions for retrieving a property value from an object and, in the case of a writable property, changing its value. You’ll also find a third accessor function for getting information about properties. For example, the Audio Unit Services function AudioUnitGetPropertyInfo tells you a given property value data type’s size and whether you can change it. The Audio Queue Services function AudioQueueGetPropertySize gets a specified property value’s size. Core Audio interfaces provide a mechanism for informing your application that a property has changed. You can read about this in the next section, Callback Functions: Interacting with Core Audio. In some cases, a property applies to an audio object as a whole. For example, to enable audio level metering in a playback audio queue object, you set the value of its kAudioQueueProperty_EnableLevelMetering property to true. Other Core Audio objects have an internal structure, each part of which may have its own set of properties. For example, an audio unit has an input scope, an output scope, and a global scope. An audio unit’s input or output scope consists of one or more elements—each of which is analogous to a channel bus in audio hardware. When you call the AudioUnitGetProperty function with the kAudioUnitProperty_AudioChannelLayout property, you specify not only the audio unit you want information about but also the scope (input or output) and element (0, 1, 2, etc.). Delivering a new set of audio data to your application (such as for recording; your callback then writes the new data to disk). Requesting a new set of audio data from your application (such as for playback; your callback reads from disk and provides the data). Telling your application that a software object has changed state (your callback takes appropriate action). One way to understand callbacks is to reverse your perspective on who calls whom. In a normal function call, such as AudioQueueNewOutput, your application invokes behavior that is defined by Apple in the implementation of the operating system. You don’t know—and don’t need to know—what goes on under the hood. Your application requests a playback audio queue object and gets one back. It works because, in making the call, you adhere to the function interface specified in the function’s header file. In the case of a callback, the operating system—when it chooses to—invokes behavior that you implement in your application. By defining a callback in your application according to a template, the operating system can successfully invoke it. For example, Audio Queue Services specifies a template for a callback—that you can implement—that lets you get and react to messages when an audio queue object property changes. This callback template, declared in the AudioQueue.h header file, is shown in Listing 2-1. Implement the callback function. For example, you might implement the audio queue property listener callback to update the titles and the enabled/disabled state of buttons in your user interface, depending on whether an audio queue object is running or stopped. Register your callback function with the object you want to interact with. One way to register a callback—typically used for callbacks that send or receive audio data—is during object creation: In the function call that creates the object, you pass a reference to your callback as a function parameter. The other way—typically used for property listeners—is by using a dedicated function call, as you will see later in this section. Listing 2-2 shows one way you might implement a property listener callback function to respond to property changes in a playback audio queue object. You would register this particular callback as shown in Listing 2-3. Core Audio insulates you from needing detailed knowledge of audio data formats. Not only does this make it easier to deal with a specific format in your code—it means that one set of code can work with any format supported by the operating system. Note: An audio data format describes audio data per se, including such things as sample rate, bit depth, and packetization. An audio file format describes how audio data, audio metadata, and filesystem metadata for a sound file are arranged on disk. Some audio file formats can contain just one sort of audio data format (for instance, an MP3 file can contain only MP3 audio data). Other file formats—such as Apple’s CAF format—can contain a variety of audio data formats. In Core Audio, you use two universal data types to represent any audio data format. These types are the data structures AudioStreamBasicDescription (Listing 2-4) and AudioStreamPacketDescription (Listing 2-5), both declared in the CoreAudioTypes.h header file and described in Core Audio Data Types Reference. In this structure, the mReserved member must always have a value of 0. Other members may have a value of 0 as well. For example, compressed audio formats use a varying number of bits per sample. For these formats, the value of the mBitsPerChannel member is 0. About the name: Although this data type has “stream” in its name, you use it in every instance where you need to represent an audio data format in Core Audio—including in non-streamed, standard files. You could think of it as the “audio format basic description” data type. The “stream” in the name refers to the fact that audio formats come into play whenever you need to move (that is, stream) audio data around in hardware or software. In discussions involving Core Audio, you’ll often hear “audio stream basic description” abbreviated to “ASBD,” which this document does as well. The audio stream packet description type comes into play for certain compressed audio data formats, as described in Audio Data Packets. For constant bit-rate audio data (as described in Audio Data Packets), the mVariableFramesInPacket member in this structure has a value of 0. You can fill in the members of an ASBD by hand in your code. When you do, you may not know the correct value for some (or any) of the structure’s members. Set those values to 0 and then use Core Audio interfaces to flesh out the structure. For example, you can use Audio File Services to give you the complete audio stream basic description for a sound file on disk as shown in Listing 2-6. Here is a fully fledged audio stream basic description example that illustrates a two-channel, canonical iPhone audio unit sample format with a 44.1 kHz sample rate. The constants and data types used as values here are declared in the CoreAudioTypes.h header file and described in Core Audio Data Types Reference. Using the AudioUnitSampleType data type here (and the AudioSampleType data type when handling audio I/O) ensures that an ASBD is platform agnostic. Two more concepts round out this introduction to audio data formats in Core Audio: magic cookies and packets, described next. In the realm of Core Audio, a magic cookie is an opaque set of metadata attached to a compressed sound file or stream. The metadata gives a decoder the details it needs to properly decompress the file or stream. You treat a magic cookie as a black box, relying on Core Audio functions to copy, read, and use the contained metadata. For example, Listing 2-7 shows a method that obtains a magic cookie from a sound file and provides it to a playback audio queue object. The previous chapter defined a packet as a collection of one or more frames. It is the smallest meaningful set of frames for a given audio data format. For this reason, it is the best unit of audio data to represent a unit of time in an audio file. Synchronization in Core Audio works by counting packets. You can use packets to calculate useful audio data buffer sizes, as shown in Listing 2-8. Every audio data format is defined, in part, by the way its packets are configured. The audio stream basic description data structure describes basic information about a format’s packets in its mBytesPerPacket and mFramesPerPacket members, as shown in Listing 2-4. For formats that require additional information, you use the audio stream packet description data structure, as described in a moment. In CBR (constant bit rate) formats, such as linear PCM and IMA/ADPCM, all packets are the same size. In VBR (variable bit rate) formats, such as AAC, Apple Lossless, and MP3, all packets have the same number of frames but the number of bits in each sample value can vary. In VFR (variable frame rate) formats, packets have a varying number of frames. There are no commonly used formats of this type. To use VBR or VFR formats in Core Audio, you use the audio stream packet description structure (Listing 2-5). Each such structure describes a single packet in a sound file. To record or play a VBR or VFR sound file, you need an array of these structures, one for each packet in the file. Interfaces in Audio File Services and Audio File Stream Services let you work with packets. For example, the AudioFileReadPackets function in AudioFile.h gives you a set of packets read from a sound file on disk, placing them in a buffer. At the same time, it gives you an array of AudioStreamPacketDescription structures that describes each of those packets. Decoding an audio format (such as AAC (Advanced Audio Coding)) to linear PCM format. Converting linear PCM data into a different audio format. Converting between different variants of linear PCM (for example, converting 16-bit signed integer linear PCM to 8.24 fixed-point linear PCM). When you use Audio Queue Services (described in Recording and Playback using Audio Queue Services), you get the appropriate converter automatically. Audio Codec Services (Mac only) lets you create specialized audio codecs, such as for handling digital rights management (DRM) or proprietary audio formats. After you create a custom codec, you can use an audio converter to access and use it. When you use an audio converter explicitly in OS X, you call a conversion function with a particular converter instance, specifying where to find the input data and where to write the output. Most conversions require a callback function to periodically supply input data to the converter. For examples of how to use audio converters, see SimpleSDK/ConvertFile and the AFConvert command-line tool in Services/AudioFileTools in the Core Audio SDK. Supported Audio File and Data Formats in OS X lists standard Core Audio codecs for translating in either direction between compressed formats and Linear PCM. For more on codecs, see Codecs. Whenever you want to work with sound files in your application, you can use Audio File Services, one of the mid-level services in Core Audio. Audio File Services provides a powerful abstraction for accessing audio data and metadata contained in files, and for creating sound files. Besides letting you work with the basics—unique file ID, file type, and data format—Audio File Services lets you work with regions and markers, looping, playback direction, SMPTE time code, and more. Audio File Stream Services, an audio stream parsing interface, lets you read audio data from disk or from a network stream. Extended Audio File Services (Mac only) encapsulates features from Audio File Services and Audio Converter Services, simplifying your code. The file system path for the file, in the form of a CFURL or NSURL object. The identifier for the type of file you want to create, as declared in the Audio File Types enumeration in AudioFile.h. For example, to create a CAF file, you use the kAudioFileCAFType identifier. The audio stream basic description for the audio data you will put in the file. In many cases you can provide a partial ASBD and later ask Audio File Services to fill it in for you. You give these three pieces of information to Audio File Services as parameters to the AudioFileCreateWithURL function, which creates the file and gives you back an AudioFileID object. You then use this object for further interaction with the sound file. The function call is shown in Listing 2-9. To open a sound file for playback, you use the AudioFileOpenURL function. You supply this function with the file’s URL, a file type hint constant, and the file access permissions you want to use. AudioFileOpenURL gives you back a unique ID for the file. There are many such identifiers available in Audio File Services that let you obtain metadata that may be in a file, such as region markers, copyright information, and playback tempo. When a VBR file is long—say, a podcast—obtaining the entire packet table can take a significant amount of time. In such a case, two property identifiers are especially useful: kAudioFilePropertyPacketSizeUpperBound and kAudioFilePropertyEstimatedDuration. You can use these to quickly approximate a VBR sound file’s duration or number of packets, in lieu of parsing the entire file to get exact numbers. In iOS you typically use Audio File Services to read audio data from, and write it to, sound files. Reading and writing are essentially mirror images of each other when you use Audio File Services. Both operations block until completion, and both can work using bytes or packets. However, unless you have special requirements, always use packets. Reading and writing by packet is the only option for VBR data. Using packet-based operations makes it much easier to compute durations. Another option in iOS for reading audio data from disk is Audio File Stream Services. For an introduction to this technology, see Sound Streams later in this chapter. Audio Queue Services, declared in the AudioQueue.h header file in the Audio Toolbox framework, is the Core Audio interface for recording and playback. For an overview of Audio Queue Services, see Recording and Playback using Audio Queue Services later in this chapter. Core Audio provides a convenience API called Extended Audio File Services. This interface encompasses the essential functions in Audio File Services and Audio Converter Services, providing automatic data conversion to and from linear PCM. See Reading and Writing Audio Data for more on this. iOS supports the audio file formats listed in Table 2-1. For information on audio data formats available in iOS, see Codecs. iOS and OS X have a native audio file format, the Core Audio Format (or CAF) file format. The CAF format was introduced in OS X v10.4 “Tiger” and is available in iOS 2.0 and newer. It is unique in that it can contain any audio data format supported on a platform. CAF files have no size restrictions—unlike AIFF and WAVE files—and can support a wide range of metadata, such as channel information and text annotations. For detailed information about the CAF file format, see Apple Core Audio Format Specification 1.0. Unlike a disk-based sound file, an audio file stream is audio data whose beginning and end you may not have access to. You encounter streams, for example, when you build an Internet radio player application. A provider typically sends their stream continuously. When a user presses Play to listen in, your application needs to jump aboard no matter what data is going by at the moment—the start, middle, or end of an audio packet, or perhaps a magic cookie. Also unlike a sound file, a stream’s data may not be reliably available. There may be dropouts, discontinuities, or pauses—depending on the vagaries of the network you get the stream from. Audio File Stream Services lets your application work with streams and all their complexities. It takes care of the parsing. To use Audio File Stream Services, you create an audio file stream object, of type AudioFileStreamID. This object serves as a proxy for the stream itself. This object also lets your application know what’s going on with the stream by way of properties (see Properties, Scopes, and Elements). For example, when Audio File Stream Services has determined the bit rate for a stream, it sets the kAudioFileStreamProperty_BitRate property on your audio file stream object. Because Audio File Stream Services performs the parsing, it becomes your application’s role to respond to being given sets of audio data and other information. You make your application responsive in this way by defining two callback functions. A user presses Play, or otherwise requests that a stream start playing. Audio File Stream Services starts parsing the stream. When enough audio data packets are parsed to send them along to your application, Audio File Stream Services sets the kAudioFileStreamProperty_ReadyToProducePackets property to true (actually, to a value of 1) in your audio file stream object. Audio File Stream Services invokes your application’s property listener callback, with a property ID value of kAudioFileStreamProperty_ReadyToProducePackets. Your property listener callback takes appropriate action, such as setting up an audio queue object for playback of the stream. Second, you need a callback for the audio data. Audio File Stream Services calls this callback whenever it has collected a set of complete audio data packets. You define this callback to handle the received audio. Typically, you play it back immediately by sending it along to Audio Queue Services. For more on playback, see the next section, Recording and Playback using Audio Queue Services. In iOS, your application runs on a device that sometimes has more important things to do, such as take a phone call. If your application is playing sound and a call comes in, the iPhone needs to do the right thing. For a first pass, this “right thing” means meeting user expectations. For a second pass, it also means that the iPhone needs to consider the current state of each running application when resolving competing requests. How do you want your application to respond to interruptions, such as a phone call? Do you intend to mix your application’s sounds with those from other running applications, or do you intend to silence them? How should your application respond to an audio route change, for example, when a user plugs in or unplugs a headset? With answers in hand, you employ the audio session interface (declared in AudioToolbox/AudioServices.h) to configure your audio session and your application. Table 2-2 describes the three programmatic features provided by this interface. A category is a key that identifies a set of audio behaviors for your application. By setting a category, you indicate your audio intentions to iOS, such as whether your audio should continue when the screen locks. Your audio session posts notifications when your audio is interrupted, when an interruption ends, and when the hardware audio route changes. These notifications let you respond to changes in the larger audio environment—such as an interruption due to in an incoming phone call—gracefully. You can query the audio session to discover characteristics of the device your application is running on, such as hardware sample rate, number of hardware channels, and whether audio input is available. When the user moves the Ring/Silent switch to silent, your audio is silenced. When the user presses the Sleep/Wake button to lock the screen, or when the Auto-Lock period expires, your audio is silenced. When your audio starts, other audio on the device—such as iPod audio that was already playing—is silenced. This set of behaviors is specified by the default audio session category, namely kAudioSessionCategory_SoloAmbientSound. iOS provides categories for a wide range of audio needs, ranging from user-interface sound effects to simultaneous audio input and output, as you would use for a VOIP (voice over Internet protocol) application. You can specify the category you want at launch and while your application runs. Audio session default behavior is enough to get you started in iPhone audio development. Except for certain special cases, however, the default behavior is unsuitable for a shipping application, as described next. One feature conspicuously absent from a default audio session is the ability to reactivate itself following an interruption. An audio session has two primary states: active and inactive. Audio can work in your application only when the audio session is active. Upon launch, your default audio session is active. However, if a phone call comes in, your session is immediately deactivated and your audio stops. This is called an interruption. If the user chooses to ignore the phone call, your application continues running. But with your audio session inactive, audio does not work. If you use OpenAL, the I/O audio unit, or Audio Queue Services for audio in your application, you must write an interruption listener callback function and explicitly reactivate your audio session when an interruption ends. Audio Session Programming Guide provides details and code examples. If you use the AVAudioPlayer class, the class takes care of audio session reactivation for you. A recording application on an iOS-based device can record only if hardware audio input is available. To test this, you use the audio session kAudioSessionProperty_AudioInputAvailable property. This is important when your application is running on devices like the iPod touch (2nd generation), which gain audio input only when appropriate accessory hardware is attached. Listing 2-10 shows how to perform the test. Your application has just one audio session category at a time—so, at a given time, all of your audio obeys the characteristics of the active category. (The one exception to this rule is audio that you play using System Sound Services—the API for alerts and user-interface sound effects. Such audio always uses the lowest priority audio session category.) Responding to Interruptions in Audio Session Programming Guide describes all the categories. When you add audio session support to your application, you can still run your app in the Simulator for development and testing. However, the Simulator does not simulate session behavior. To test the behavior of your audio session code, you need to run on a device. Note: Ignoring Audio Session Services will not prevent your application from running, but your app may not behave the way you want it to. In most cases, you should not ship an iPhone or iPod touch application that uses audio without using this interface, as described earlier in this section. The AVAudioPlayer class provides a simple Objective-C interface for audio playback. If your application does not require stereo positioning or precise synchronization, and if you are not playing audio captured from a network stream, Apple recommends that you use this class for playback. The AVAudioPlayer class lets you play sound in any audio format available in iOS. For a complete description of this class’s interface, see AVAudioPlayer Class Reference. Unlike OpenAL, the I/O audio unit, and Audio Queue Services, the AVAudioPlayer class does not require that you use Audio Session Services. An audio player reactivates itself following an interruption. If you want the behavior specified by the default audio session category (see Audio Sessions: Cooperating with Core Audio), such as having your audio stop when the screen locks, you can successfully use the default audio session with an audio player. To configure an audio player for playback, you assign a sound file to it, prepare it to play, and designate a delegate object. The code in Listing 2-11 would typically go into an initialization method of the controller class for your application. You use a delegate object (which can be your controller object) to handle interruptions and to update the user interface when a sound has finished playing. The delegate methods for the AVAudioPlayer class are described in AVAudioPlayerDelegate Protocol Reference. Listing 2-12 shows a simple implementation of one delegate method. This code updates the title of a Play/Pause toggle button when a sound has finished playing. To play, pause, or stop an AVAudioPlayer object, call one of its playback control methods. You can test whether or not playback is in progress by using the playing property. Listing 2-13 shows a basic play/pause toggle method that controls playback and updates the title of a UIButton object. For more information on the AVAudioPlayer class, see AVAudioPlayer Class Reference. Audio Queue Services provides a straightforward, low overhead way to record and play audio. It lets your application use hardware recording and playback devices (such as microphones and loudspeakers) without knowledge of the hardware interface. It also lets you use sophisticated codecs without knowledge of how the codecs work. Although it is a high-level interface, Audio Queue Services supports some advanced features. It provides fine-grained timing control to support scheduled playback and synchronization. You can use it to synchronize playback of multiple audio queues, to play sounds simultaneously, to independently control playback level of multiple sounds, and to perform looping. Audio Queue Services and the AVAudioPlayer class (see Playback using the AVAudioPlayer Class) are the only ways to play compressed audio on an iPhone or iPod touch. You typically use Audio Queue Services in conjunction with Audio File Services (as described in Sound Files) or with Audio File Stream Services (as described in Sound Streams). As is the case with Audio File Stream Services, you interact with audio queue objects using callbacks and properties. For recording, you implement a callback function that accepts audio data buffers—provided by your recording audio queue object—and writes them to disk. Your audio queue object invokes your callback when there is a new buffer of incoming data to record. Figure 2-2 illustrates a simplified view of this process. For playback, your audio callback has a converse role. It gets called when your playback audio queue object needs another buffer’s worth of audio to play. Your callback then reads a given number of audio packets from disk and hands them off to one of the audio queue object’s buffers. The audio queue object plays that buffer in turn. Figure 2-3 illustrates this. To use Audio Queue Services, you first create an audio queue object—of which there are two flavors, although both have the data type AudioQueueRef. You create a recording audio queue object using the AudioQueueNewInput function. You create a playback audio queue object using the AudioQueueNewOutput function. Create a data structure to manage information needed by the audio queue, such as the audio format for the data you want to play. Define a callback function for managing audio queue buffers. The callback uses Audio File Services to read the file you want to play. Instantiate the playback audio queue using the AudioQueueNewOutput function. Audio queue objects give you two ways to control playback level. To set playback level directly, use the AudioQueueSetParameter function with the kAudioQueueParam_Volume parameter, as shown in Listing 2-15. Level change takes effect immediately. You can also set playback level for an audio queue buffer, using the AudioQueueEnqueueBufferWithParameters function. This lets you assign audio queue settings that are, in effect, carried by an audio queue buffer as you enqueue it. Such changes take effect when the audio queue buffer begins playing. In both cases, level changes for an audio queue remain in effect until you change them again. To play multiple sounds simultaneously, create one playback audio queue object for each sound. For each audio queue, schedule the first buffer of audio to start at the same time using the AudioQueueEnqueueBufferWithParameters function. To play high quality, simultaneous sounds, use linear PCM or IMA4 audio. Linear PCM and IMA/ADPCM (IMA4) audio You can play multiple linear PCM or IMA4 format sounds simultaneously in iOS without incurring CPU resource problems. AAC, MP3, and Apple Lossless (ALAC) audio Playback for AAC, MP3, and Apple Lossless (ALAC) sounds uses efficient hardware-based decoding on iPhone and iPod touch. You can play only one such sound at a time. For a complete description of how to use Audio Queue Services for recording and playback, including code samples, see Audio Queue Services Programming Guide. The open-sourced OpenAL audio API—available in the OpenAL framework and built on top of Core Audio—is optimized for positioning sounds during playback. OpenAL makes it easy to play, position, mix, and move sounds, using an interface modeled after OpenGL. OpenAL and OpenGL share a common coordinate system, enabling you to synchronize the movements of sounds and on-screen graphical objects. OpenAL uses Core Audio’s I/O audio unit (see Audio Units) directly, resulting in lowest-latency playback. For all of these reasons, OpenAL is your best choice for playing sound effects in game applications on iPhone and iPod touch. OpenAL is also a good choice for general iOS application playback needs. OpenAL 1.1 in iOS does not support audio capture. For recording in iOS, use Audio Queue Services. alBufferDataStaticProcPtr follows the use pattern for alBufferData but eliminates a buffer data copy. alcMacOSXMixerOutputRateProcPtr lets you control the sample rate of the underlying mixer. For a Mac example of using OpenAL in Core Audio, see Services/OpenALExample in the Core Audio SDK. To play short sound files when you do not need level, positioning, audio session, or other control, use System Sound Services, declared in the AudioServices.h header file in the Audio Toolbox framework. This interface is ideal when you just want to play a short sound in the simplest way possible. In iOS, sounds played using System Sound Services are limited to a maximum duration of 30 seconds. You can explicitly invoke vibration on an iPhone by using the kSystemSoundID_Vibrate constant when you call the AudioServicesPlaySystemSound function. To play a sound with the AudioServicesPlaySystemSound function, you first register your sound effect file as a system sound by creating a sound ID object. You can then play the sound. In typical use, which includes playing a sound occasionally or repeatedly, retain the sound ID object until your application quits. If you know that you will use a sound only once—for example, in the case of a startup sound—you can destroy the sound ID object immediately after playing the sound, freeing memory. Listing 2-17 shows a minimal program that uses the interfaces in System Sound Services to play a sound. The sound completion callback, and the call that installs it, are primarily useful when you want to free memory after playing a sound in cases where you know you will not be playing the sound again. // playing. Useful when you need to free memory after playing. // Set up the pieces needed to play a sound. // Register the sound completion callback. // Again, useful when you need to free memory after playing. // Play the sound file. // callback later stops this run loop. Core Audio has a plug-in mechanism for processing audio data. In iOS, the system supplies these plug-ins. In OS X, you have built-in plug-ins and can also create your own. Multiple host application can each use multiple instances of an audio unit or codec. In iOS, audio units provide the mechanism for applications to achieve low-latency input and output. They also provide certain DSP features, as described here. In OS X, audio units are most prominent as add-ons to audio applications like GarageBand and Logic Studio. In this role, an audio unit has its own user interface, or view. Audio units in iOS do not have views. On either platform, you find the programmatic names of the built-in audio units in the AUComponent.h header file in the Audio Unit framework. 3D mixer unit—Allows any number of mono inputs, each of which can be 8-bit or 16-bit linear PCM. Provides one stereo output in 8.24-bit fixed-point PCM. The 3D mixer unit performs sample rate conversion on its inputs and provides a great deal of control over each input channel. This control includes volume, muting, panning, distance attenuation, and rate control for these changes. Programmatically, this is the kAudioUnitSubType_AU3DMixerEmbedded unit. Multichannel mixer unit—Allows any number of mono or stereo inputs, each of which can be 16-bit linear or 8.24-bit fixed-point PCM. Provides one stereo output in 8.24-bit fixed-point PCM. Your application can mute and unmute each input channel as well as control its volume. Programmatically, this is the kAudioUnitSubType_MultiChannelMixer unit. Converter unit—Provides sample rate, bit depth, and bit format (linear to fixed-point) conversions. The iPhone converter unit’s canonical data format is 8.24-bit fixed-point PCM. It converts to or from this format. Programmatically, this is the kAudioUnitSubType_AUConverter unit. I/O unit—Provides real-time audio input and output and performs sample rate conversion as needed. Programmatically, this is the kAudioUnitSubType_RemoteIO unit. iPod EQ unit—Provides a simple equalizer you can use in your application, with the same presets available in the built-in iPhone iPod application. The iPod EQ unit uses 8.24-bit fixed-point PCM input and output. Programmatically, this is the kAudioUnitSubType_AUiPodEQ unit. 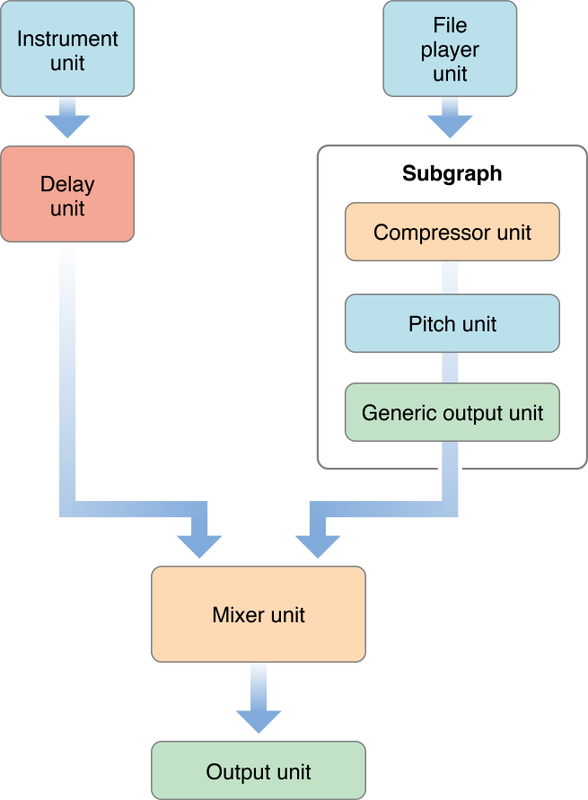 The special category of audio unit known as the I/O unit is described further in Audio Processing Graphs, because of the important role that such audio units play there. OS X provides more than 40 audio units, all of which you can find listed in System-Supplied Audio Units in OS X. You can also create your own audio units, either as building blocks for your application or to provide to customers as products in their own right. Refer to Audio Unit Programming Guide for more information. OS X audio units use noninterleaved 32-bit floating point linear PCM data for input and output—except in the case of an audio unit that is a data format converter, which converts to or from this format. OS X audio units may also support other linear PCM variants—but no formats other than linear PCM. This ensures compatibility with audio units from Apple and other vendors. To convert audio data of a different format to linear PCM, you can use an audio converter (see Data Format Conversion. In iOS and in OS X, host applications use functions in Audio Unit Services to discover and load audio units. Each audio unit is uniquely identified by a three-element combination of type, subtype, and manufacturer code. The type code, specified by Apple, indicates the general purpose of the unit (effect, generator, and so on). The subtype describes more precisely what an audio unit does, but is not programmatically significant for audio units. If your company provides more than one effect unit, however, each must have a distinct subtype to distinguish it from the others. The manufacturer code identifies you as the developer of your audio units. Apple expects you to register a manufacturer code, as a “creator code,“ on the Data Type Registration page. Audio units describe their capabilities and configuration information using properties, as described in Properties, Scopes, and Elements. Each audio unit type has some required properties, as defined by Apple, but you are free to add additional properties based on your audio unit’s needs. In OS X, host applications can use property information to create a generic view for an audio unit, and you can provide a custom view as an integral piece of your audio unit. Audio units also use a parameter mechanism for settings that are adjustable in real time, often by the end user. These parameters are not arguments to functions, but rather a mechanism that supports user adjustments to audio unit behavior. For example, a parametric filter unit may have parameters for center frequency and width of filter response, settable through a view. To monitor changes in the state of an audio unit in OS X, applications can register callback functions (sometimes called listeners) that are invoked when particular audio unit events occur. For example, a Mac app might want to know when a user moves a slider in an audio unit’s view, or when audio data flow is interrupted. See Technical Note TN2104: Handling Audio Unit Events for more details. The Core Audio SDK (in its AudioUnits folder) provides templates for common audio unit types (for example, effect units and instrument units) along with a C++ framework that implements most of the Component Manager plug-in interface for you. For detailed information about building audio units for OS X using the SDK, see Audio Unit Programming Guide. The recording and playback codecs available in iOS are chosen to balance audio quality, flexibility in application development, hardware features, and battery life. There are two groups of playback codecs in iOS. The first group, listed in Table 2-3, includes highly efficient formats that you can use without restriction. That is, you can play more than one instance of each of these formats at the same time. For information on audio file formats supported in iOS, see iPhone Audio File Formats. iOS contains the recording codecs listed in Table 2-5. As you can see, neither MP3 nor AAC recording is available. This is due to the high CPU overhead, and consequent battery drain, of these formats. In OS X, you find a wide array of codecs and supported formats, described in Supported Audio File and Data Formats in OS X.
OS X also provides interfaces for using and creating audio data codecs. These interfaces are declared in the AudioConverter.h header file (in the Audio Toolbox framework) and AudioCodec.h (in the Audio Unit framework). Common Tasks in OS X describes how you might use these services. An audio processing graph (sometimes called an AUGraph) defines a collection of audio units strung together to perform a complex task. For example, a graph could distort a signal, compress it, and then pan it to a particular location in the soundstage. When you define a graph, you have a reusable processing module that you can add to and remove from a signal chain in your application. A processing graph typically ends in an I/O unit (sometimes called an output unit). An I/O unit often interfaces (indirectly—via low-level services) with hardware, but this is not a requirement. An I/O unit can send its output, instead, back to your application. You may also see an I/O unit referred to as the head node in a processing graph. I/O units are the only ones that can start and stop data flow in a graph. This is an essential aspect of the so-called pull mechanism that audio units use to obtain data. Each audio unit in a graph registers a rendering callback with its successor, allowing that successor to request audio data. When an I/O unit starts the data flow (triggered, in turn, by your application), its render method calls back to the preceding audio unit in the chain to ask for data, which in turn calls its predecessor, and so on. iOS has a single I/O unit, as described in Audio Units. The story on OS X is a bit more complex. The AUHAL unit is for dedicated input and output to a specific hardware device. See Technical Note TN2091, Device input using the HAL Output Audio Unit. The Generic I/O unit lets you connect the output of an audio processing graph to your application. You can also use a generic I/O unit as the head node of a subgraph, as you can see in Figure 2-6. The System I/O unit is for alerts and user interface sound effects. The Default I/O unit is for all other audio input and output. The Audio MIDI Setup application (Mac only; in the Utilities folder) lets a user direct the connections of the System I/O and Default I/O units separately. Figure 2-4 shows a simple audio processing graph, in which signal flows from the top to the bottom. Each audio unit in an audio processing graph can be called a node. You make a processing graph connection by attaching an output from one node to the input of another. 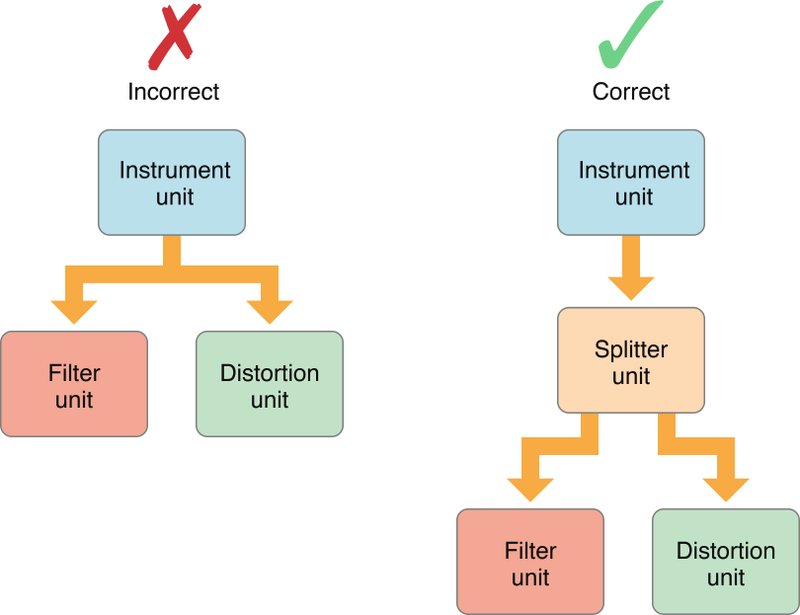 You cannot connect a single output to more than one input unless you use an intervening splitter unit, as shown in Figure 2-5. However, an audio unit may be designed to provide multiple outputs or inputs, depending on its type. A splitter unit does this, for example. You can use Audio Processing Graph Services to combine subgraphs into a larger graph, where a subgraph appears as a single node in the larger graph. Figure 2-6 illustrates this. Each graph or subgraph must end in an I/O unit. A subgraph, or a graph whose output feeds your application, should end with the generic I/O unit, which does not connect to hardware. While you can link audio units programmatically without using an audio processing graph, it’s rarely a good idea. Graphs offer important advantages. You can modify a graph dynamically, allowing you to change the signal path while processing data. In addition, because a graph encapsulates an interconnection of audio units, you instantiate a graph in one step instead of explicitly instantiating each of the audio units it references. Core MIDI Services defines an interface that applications and audio units can use to communicate with MIDI devices. It uses a number of abstractions that allow an application to interact with a MIDI network. A MIDI endpoint (defined by an opaque type MIDIEndpointRef) represents a source or destination for a standard 16-channel MIDI data stream. You can associate endpoints with tracks used by Music Player Services, allowing you to record or play back MIDI data. A MIDI endpoint is a proxy object for a standard MIDI cable connection. MIDI endpoints do not necessarily have to correspond to a physical device, however; an application can set itself up as a virtual source or destination to send or receive MIDI data. MIDI drivers often combine multiple endpoints into logical groups, called MIDI entities (MIDIEntityRef). For example, it would be reasonable to group a MIDI-in endpoint and a MIDI-out endpoint as a MIDI entity, which can then be easily referenced for bidirectional communication with a device or application. Each physical MIDI device (not a single MIDI connection) is represented by a Core MIDI device object (MIDIDeviceRef). Each device object may contain one or more MIDI entities. Core MIDI communicates with the MIDI Server, which does the actual job of passing MIDI data between applications and devices. The MIDI Server runs in its own process, independent of any application. Figure 2-7 shows the relationship between Core MIDI and MIDI Server. In addition to providing an application-agnostic base for MIDI communications, MIDI Server also handles any MIDI thru connections, which allows device-to device chaining without involving the host application. If you are a MIDI device manufacturer, you may need to supply a CFPlugin plug-in for the MIDI Server packaged in a CFBundle to interact with the kernel-level I/O Kit drivers. 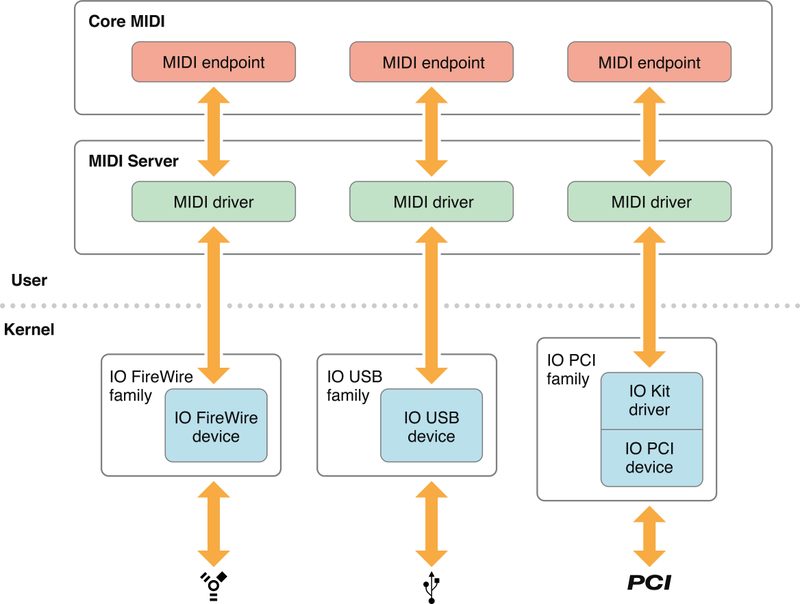 Figure 2-8 shows how Core MIDI and Core MIDI Server interact with the underlying hardware. Note: If you create a USB MIDI class-compliant device, you do not have to write your own driver, because Apple’s supplied USB driver will support your hardware. The drivers for each MIDI device generally exist outside the kernel, running in the MIDI Server process. These drivers interact with the default I/O Kit drivers for the underlying protocols (such as USB and FireWire). The MIDI drivers are responsible for presenting the raw device data to Core MIDI in a usable format. Core MIDI then passes the MIDI information to your application through the designated MIDI endpoints, which are the abstract representations of the MIDI ports on the external devices. MIDI devices on PCI cards, however, cannot be controlled entirely through a user-space driver. For PCI cards, you must create a kernel extension to provide a custom user client. This client must either control the PCI device itself (providing a simple message queue for the user-space driver) or map the address range of the PCI device into the address of the MIDI server when requested to do so by the user-space driver. Doing so allows the user-space driver to control the PCI device directly. For an example of implementing a user-space MIDI driver, see MIDI/SampleUSBDriver in the Core Audio SDK. Music Player Services allows you to arrange and play a collection of MIDI music tracks. A track is a stream of MIDI or event data (represented by the MusicTrack data type). Tracks contain a series of time-based events, which can be MIDI data, Core Audio event data, or custom event messages. You can think of a track as sheet music for one instrument. A sequence is a collection of tracks (represented by the MusicSequence data type). A sequence always contains an separate tempo track, used for synchronizing all its tracks. You can think of a sequence as a musical score, which collects the sheet music for multiple instruments. Your Mac app can add, delete, or edit tracks in a sequence dynamically. To play a sequence you assign it to a music player object (of type MusicPlayer), which acts as the conductor, controlling the playback of the sequence. To produce sound, you send each track to an instrument unit or to an external MIDI device. Track data does not have to represent musical information. You could instead use a track to implement audio unit automation. For example, a track assigned to a panner unit could control the apparent position of a sound source in the soundstage. Tracks can also contain proprietary user events that trigger an application-defined callback. For more information about using Music Player Services to play MIDI data, see Handling MIDI Data. Core Audio Clock Services provides a reference clock that you can use to synchronize applications and devices. This clock may be a standalone timing source or it can be synchronized with an external trigger, such as a MIDI beat clock or MIDI time code. You can start and stop the clock yourself, or you can set the clock to activate or deactivate in response to certain events. You can obtain the generated clock time in a number of formats, including seconds, beats, SMPTE time, audio sample time, and bar-beat time. The latter describes the time in a manner that is easy to display onscreen in terms of musical bars, beats, and subbeats. Core Audio Clock Services also contains utility functions that convert one time format to another and that display bar-beat or SMPTE times. Figure 2-9 shows the interrelationship between various Core Audio Clock formats. The hardware times represent absolute time values from either the host time (the system clock) or an audio time obtained from an external audio device (represented by an AudioDevice object in the HAL). You determine the current host time by calling mach_absolute_time or UpTime. The audio time is the audio device’s current time represented by a sample number. The sample number’s rate of change depends on the audio device’s sampling rate. The media times represent common timing methods for audio data. The canonical representation is in seconds, expressed as a double-precision floating point value. 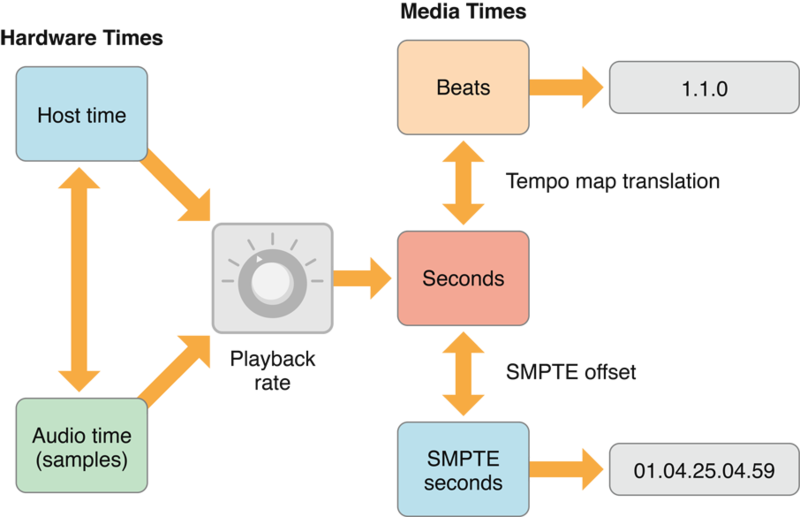 However, you can use a tempo map to translate seconds into musical bar-beat time, or apply a SMPTE offset to convert seconds to SMPTE seconds. Media times do not have to correspond to real time. For example, an audio file that is 10 seconds long will take only 5 seconds to play if you double the playback rate. The knob in Services Available in iOS Only indicates that you can adjust the correlation between the absolute (“real”) times and the media-based times. For example, bar-beat notation indicates the rhythm of a musical line and what notes to play when, but does not indicate how long it takes to play. To determine that, you need to know the playback rate (say, in beats per second). Similarly, the correspondence of SMPTE time to actual time depends on such factors as the frame rate and whether frames are dropped or not.